I, myself, am a late bloomer. In 2010, I retired from my “real job” of 17 years to become a freelance writer. 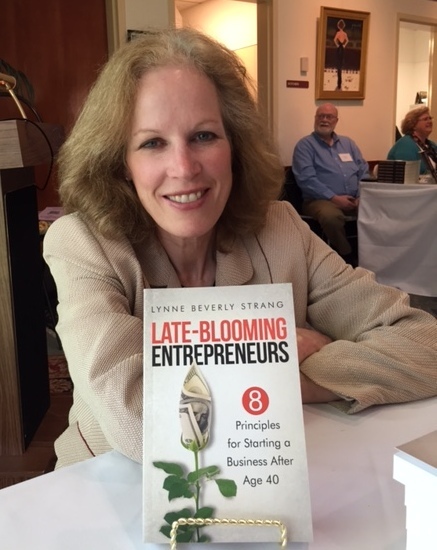 After I left the traditional work world, I wrote a book about the basic principles followed by established late-blooming entrepreneurs to achieve profitability. It was a great experience to interview many fascinating people who, while in their 40s and later, started and built successful businesses. Twenty years ago, I never expected to become an author or a blogger. Well, here I am. My main entrepreneurial challenge these days is my freelance writing practice. Much of my work involves helping business owners meet their marketing and communications goals. I also maintain a small publishing business as there may be another book in my future. When I’m not writing about entrepreneurs, I enjoy reading, public speaking, healthy cooking and exercise (especially cycling) — so some posts on those subjects might sneak in from time to time. That’s been the best part! Congratulations on being Freshly Pressed! This is a great topic to cover, the older demographic is a neglected one, especially in the business/career area. Will follow your future posts! Thanks, Mike. I agree on both counts, including the cycling! I read the story you did on Bill the wheel maker, great stuff, I would like to do exactly that myself when I retire in 3 years. I have been doing the same job as an electrician for 48 years because I have had to. I cant wait till I can do what I want, when I want, for who I want and give a little back. I have been a bike rider all of my life and just love every minute on my beloved bike. So thank you and stick to your bike what ever you do. I’m enjoying your blooming blog! Keep the good news stories coming. Thanks, Kathy. I’ll do my best! We become wiser as we grow! I have started my own cooking school after many years working for others both in the hospitality industry and other work. It’s a ‘organically’ growing business, still having a full time job but I am loving it and to has seen a lot of growth this year. The mature years rock! They sure do! Congratulations on starting your own cooking school! Your blog reminds me of “Growing Bolder”, a show on some public TV stations. You should check out their website (http://tv.growingbolder.com) for some inspirational stores about ordinary people pursuing their passion later in life. It’s never too late to impact others’ lives. Looks like a very interesting show. Thanks for letting me know about it. Thank you, Shari. The first step is to believe you can do it — and sometimes it takes a third party to help show the way. Those entrepreneurs are fortunate to have you in their corner. Happy to have found your blog and look forward to more of your posts. Thank you. Many people decide to become entrepreneurs so they can have an alternative workstyle. Looks like you’re covering an important aspect of entrepreneurship! Really glad I found your blog. I too am a mid-life entrepreneur. I started a marketing communications and consulting firm a year and a half ago and I’m loving every minute of it. Kudos to you AND THANK YOU for exploring the life of the mid-life entrepreneur. I’ve always thought of myself as a late bloomer. And it is great to be here, now. Thank you for your kind words. So many people are doing great things in the second halves of their lives! I’m just glad I can highlight some of their stories — and provide encouragement to others who want to pursue their dreams. It’s a good place to be! Welcome! Glad to have you! By the way, your recipes look wonderful! This is great. I am so glad I found your blog. For as long as I can remember I have toyed with the idea of being my own boss. Time continued to pass me by and with each year I felt more and more like the dream was getting away from me. I have a “real job” but that’s just the problem. No matter how hard I try to enjoy it it’s still just a job. I find myself daydreaming of my own business all the time but afraid to take that first step. Am I too old? I’m hoping to be able to make that dream come true. It’s hard to give up the security that comes with a regular paycheck. You certainly aren’t too old — but you do need a well-thought-out plan and a long-term commitment to turn your dream into a reality. I hope the stories and resources found on this blog help you take that first step. Thank you for reading — and good luck! I’m happy to have found your blog! Your blog is great! As a student who is passionate about business and finance, your articles make me very interested. Keep up the great posts! Thank you. While this blog’s overall content is geared toward late-blooming entrepreneurs, I’m glad it attract readers of all ages. After a long search some of us finally “get” it. Sometimes it takes a while to figure out what you want. Nice blog. Writer it seems you be! LOL. I try as well, and I guess you start to see a person’s character come through the words after a while. Strength, determination, perseverance… blog on! The three traits you named are critical for entrepreneurial success. Blog on I shall! Thanks for commenting. I am glad I found your blog, I am in the process of being a late bloomer! Good to hear! Your photography is beautiful! Congratulations! Very inspiring and I can so relate. I’m a web content writer here in the Philippines and same as you I’m also 40. My eldest son together with my long time partner have put up a granite installation business. I know it’s 2 different worlds but I enjoy them both. However, I can’t let go of my first love – writing. Thanks and continue to shine and inspire people. There’s no reason you can’t continue to enjoy both of your loves — although good time management skills may become more important. Thank you for reading! Thank you, Atom. I see that you’re a writer. The blogging world has many good sites dedicated to writing. One of my favorites is Live to Write – Write to Live. It’s listed under the blogs I read. You might want to click on the link and check it out. When it comes to goal setting, visualization can be a powerful tool! I hope you’ll enjoy the ones to come. Thanks for reading. I have just started my WordPress presence exactly 1 hour ago. And, I am SO glad I found you! 1) ..because I am in my early 40s, and 2) I feel like this is a new beginning for me navigating uncharted waters of the online type. I am very good at offline, but this one is definitely a new + strange animal indeed. Also, congratulations on your new book too Lynne! You bring to all of us in our prime lol. I can relate to the “strange animal” comparison because I felt the same way when I started blogging three years ago. The best advice I received back then was to just start writing. Initially, few people will be reading — which is a good thing because it gives you time to become comfortable with the process, make mistakes without worry and develop your “voice.” Best of luck! I think i will keep coming back for more. I see inspiration here. Just started my own blog in September 2013. Good for you. I like your blog’s concept of beauty for all ages. Hello out there, 81 has just become 82. I have a number of ideas of things I would like to do but first I would like to create an affiliate blog to support my plans. My main interests are sailing (from my desk now), painting and drawing, and things financial. And picture framing (this was my last business). Michael. So let’s see… you’re interests include sailing, painting, drawing, finances and picture framing. That’s quite a diverse list! I think you could start a blog on any of these topics — or maybe combine a couple of them (for example, you could have an art-related blog that covers painting and drawing). Good luck! Thank you for your comment. I would like to use one of these topics but first I wish to change (edit) my 2012 Theme. Where can I find the theme and how do I edit it bearing in-mind I will require to add widgets? I’d suggest visiting WordPress’ community discussion boards. You’ll find plenty of information there to help you. Interesting reading. I, myself, am 50 years old and just now learning success principles and starting a business. Sure wish I knew then what I know now, but it’s never too late to make a change! No, it isn’t. And chances are that you’ll be able to apply those success principles in ways you couldn’t when you were younger. Congratulations on your new business! It is really a great thing for me to discover this blog.You are an inspiration for my dreams.I am 40 years old and wish to have my own business. That’s a terrific goal to have. Just keep in mind that starting a business is one thing — and keeping it going is another. I hope this blog helps you with both. Lynne, I love your journey and think the topic resonates with a lot of people out there who want to pursue their dream. Keep it coming! Thanks, Paul. I’ll do my best! Thanks for being an encouragement. As an independent, singer/songwriter/musician, it is not easy to keep after your dreams. But too many people give up. Thanks for writing and sharing with the world so some of the rest of us don’t give up. Look forward to playing in your area someday and meeting you. Thank you, Leah. I like your music! I am going the entrepreneurial route after 20 years of working for large corporations, and 10 years of talking about starting something. Came across your blog and think that it is a great resource – very inspiring to read. Thanks! Glad to have you as a reader. Leaving the corporate world means giving up the security of a steady paycheck and benefits — so the ten-year time period is totally understandable. Congratulations on making the transition. I’m very glad to have found your blog! I’ve had a couple of careers (both of which I’ve enjoyed very much), and now in my mid-40s I’m in the process of starting a social enterprise. I also blog about flexi/home-based working, and how to make that work well – so I’m pretty interested in all forms of ‘non mainstream’ career paths. So much pressure is put on young people to find their path and choose what they want to do – I thinks it’s great to show that you can successfully do a number of different things, and reinvent yourself. I’m looking forward to exploring more of your blog. Best wishes. Some good points, especially the one about young people finding a career path. The idea of having multiple careers may be difficult to envision when you’re first starting out in your professional life. Thanks for commenting. Great topic. Interested in what you have to share. I have a lot of material to work with, fortunately. Glad to have you as a reader. You’re welcome. I can always use a laugh and/or some entertainment! As someone starting out from a younger age, I find your stories and ideas not only entertaining but very insightful. Thank you. You’re welcome. I’m glad the posts have value for entrepreneurs of all ages. I’m honored, Krista. Thank you! Just over here in my late 20s, and taking notes from the pros! It’s a great inspiration to see someone quit the day job and find true success in life’s joys! Welcome, Bailey! I hope you find some ideas here that will help you get to where you want to go. Good for you! At first, going from a landscaping business to a food truck seems like quite a jump — but I can see where the two areas might overlap. Both businesses, for example, involve creativity and an ability to visualize the big picture. Wishing you all the best. I’m honored, Kally. Thank you! You’re most welcome! A deserving award for a deserving you. I am an older college student soon to graduate and planning to do some “late blooming” in marketing and/or business communication — I just started a WordPress blog called “Wildflower Sunrise” and a photography portfolio called the “Wild Olive.” I love your site and plan to check in on your late bloomers and their stories. Looks like you have some beautiful wildflowers in Central Texas. Congratulations on your new blog and portfolio. I just stumbled upon your blog and think what you are putting together is wonderful! I look forward to reading your blog posts for some inspiration. Thank you. Barefoot wine is quite a success story! Glad to have you as a reader.